Ultra High Definition (UHD) is a technological advancement in the television industry after Full HD and offers four times enhanced resolution as compared to the full high definition (HD) television and hence is also known as a 4K television set. Globally, growing demand and consumption of HD televisions as result of digitization of cable network is expected to drive the demand for the ultra high definition (UHD) televisions during the period of study. Geographically, North America dominated the ultra high definition (UHD) TV market driven by higher demand and consumption of ultra high definition (UHD) TV sets due to digitized cable network with HD support coupled with high purchasing power of citizens in the region. North America was followed by Europe and Asia-Pacific as second and third largest market for the ultra high definition (UHD) TV market. Asia Pacific is projected to have the fastest growth, owing to rapidly increasing demand and consumption by people in the region as a result of increasing disposable income and digitization of cable network in developing nations such as China and India in this region. This report identifies the ultra high definition (UHD) TV market size for the years 2014-2016, and forecast of the same till the year 2022. 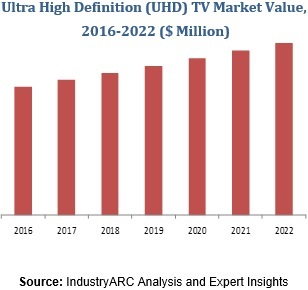 It also highlights the market drivers, restraints, growth indicators, challenges, and other key aspects with respect to the ultra high definition (UHD) TV market.